Holiday planning is in full swing, so this Thursday for Crafty Thursdays we are recapping our Christmas in July Feature: The Crime Scene Christmas Tree. 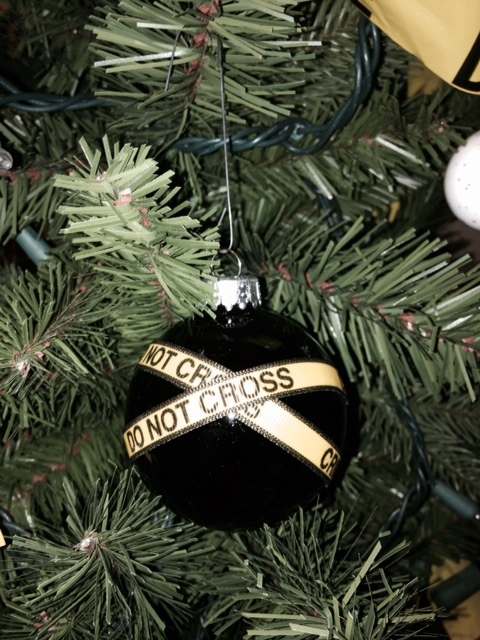 That's right, we spent the whole month of July making crime scene ornaments. Well, not the whole month. All of these are pretty fast and easy, so you still have time. Just click on the links to get to the original post with instructions. Let's start out with my favorite ornament: The Suspect (pictured above). Because you can't have a fictional crime scene without a suspect. Second we have the blood splatter ornaments. These were designed and created by the lovely and talented Kerry Hammond. Here we have the Clue Ornaments, designed and created by the lovely and talented, Kim Hammond. And last but not least, the fabulous fingerprint tree skirt by Kerry Hammond with our final Crime Scene Tree.